I admit, that title is misleading. I’m not talking about THE devil – not that cad! I’m on about the Tasmanian Devil. And even there, I’m talking about the kind that lives in the wild – not the slobbering whirling dervish we all know from the cartoon. I’ve seen these critters in the zoo, and they’re a fascinating species. 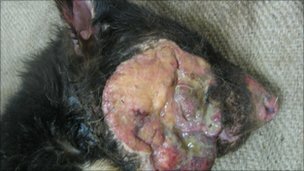 Devil populations have been decimated by a highly contagious facial cancer that is transferred when these aggressive animals bite each other. The findings will help researchers select the best individuals to be kept in captivity for eventual re-release. The research is outlined in Proceedings of the National Academy of Sciences. The Tasmanian devil, Sarcophilus harrisii, gets its name from its high-pitch, blood-curdling squeal, and is renowned for fighting over access to animal carcases, which it grinds with the bone-crushing force of its jaws. The devil’s immune system seems unable to detect the cancer. The disease forms tumours around the mouth interfering with feeding leading to death. The cancer originally arose in Schwann cells – cells which wrap themselves around nerve tissue and was first seen in 1996. The cancer has since decimated devil populations. Head on over to the BBC article, HERE to learn more.